Deluxe knapping kits for sale and testosterone imbued knappers comparing the size of their kits can be seen all over the WWW giving the impression to begin knapping you must have a wallet the size of Bill Gates. Here I want to discuss what you really need to get knapping and how little it really costs. 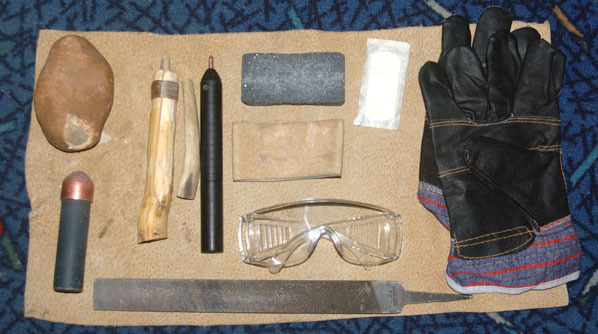 To begin Flint knapping you need very few tools. Most knappers have amounted large collections over the years, but really most equipment they have is luxury not essential. 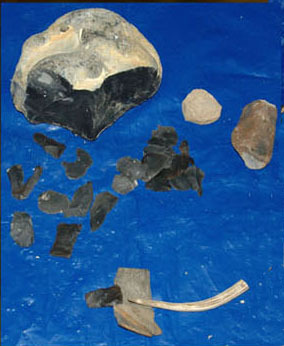 Read post 4 Techniques of Knapping to find out what these are. And how you intend to do it: Authentic or Inauthentic tools. Authentic tools has a wide range of definitions I tend to define it as using the tools that were available at the time. So even though a 4000 year old tool is authentic, if you are going to use it on a 50,000 year old style point you are making, you haven’t done authentic knapping. Inauthentic tools then simply means tools more modern than the piece you are knapping, these could be high tech wonders or simply copper in the stone age. You will most likely be doing three kinds of knapping, Percussion Flaking, Pressure Flaking, and may be Spalling. Here I will list the essentials. The total cost of the equipment there is about £120 but I bought it over many years. However 75% of the items are unnecessary and most that are can be replace with a free object. For pressure flaking you will need a pressure flaker. Generally it needs to be kept pointed by filing. The pressure flaker can be a commercially bought plastic one or as simple as a copper nail in a piece of wood. 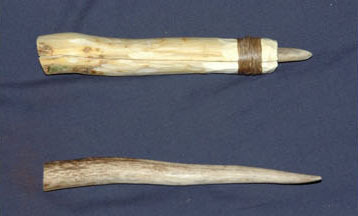 Alternatively you can use a deer antler or a deer antler inserted into a piece of wood as in the picture above. Most knappers use a pad to hold the piece they are making when flaking. Leather pads are popular but I have seen knappers use anything that comes to hand, such as folded linen. 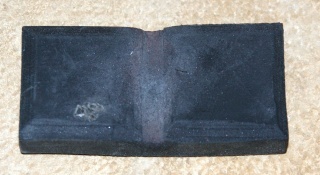 An alternative to a pad is a channelled rubber pad, these can be bought or made at home. Abraders are essential, there are three methods to get one. You can buy an abrader from a commercial site, find a piece of rough rock laying around or try this method. You will need an abrader as mentioned above preferably rougher. The same options are avialbe for acquiring one. A hard hammer which can be a large pebble of similarly shaped hard rock. Alternatively you can buy a solid copper billet. The only thing you really need to buy is a soft hammer. These can be made from moose or large deer antlers. Copper boppers can be made at home. Leg Protection can be leather or even simple thick material such as an old linen sheet folded thickly. Spalling is when you hit the large flint nodule to create small flakes to work with. Basically what you use needs to be big and heavy. I used a modern club hammer, but knapping shops sell copper plated steel hammers or all copper hammers. Huge all copper billets can be bought or a large rock found free of charge. If you are placing the stone on your leg while spalling you will definately need some protection. 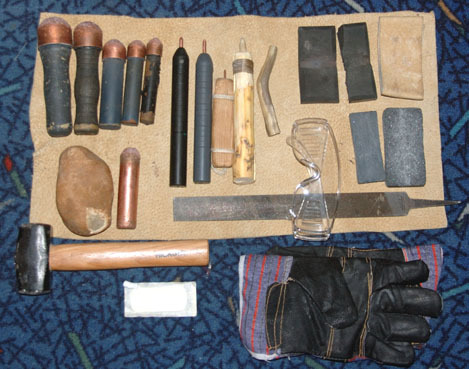 Generally there are only two safety tools in knapping: safety glasses and leather gloves. Glasses should ideally be worn at all times, though many knappers don't use them when pressure flaking, they are a must when spalling. To glove or not to glove is the knapping dilemma. Many choose not to and if you do not you will get cut. Myself I wear two gloves when spalling, one on the holding hand when percussion flaking (as I free hand percuss) and none when pressure flaking. I get cut regularly. Gloves need to be tough leather, nothing else will stop the sharp edges. Regularly abrading sharp edges is an advised safety measure. Having a box of plasters on hand is a good idea as you will need to stop the bleeding. Breathing in the dust from knapping is deadly. Knapping should be done outdoors, especially when abrading or spalling and percussing. If you do it inside, stick to pressure flaking and use a fan on yourself blowing the dust away. Here's a revised version of everything you need. This lot cost £37, if you use an old linen sheet instead of leather leg protection and make your own pressure flaker, the price drops to £18. If you use a rock abrader and your own pad another £6 comes off. Okay, novice question number one - why do you fit a copper nail instead if a steel/iron one please? Please don't take this as gospel, but I'll have a pop. One of the the reasons is authenticity, a lot of knapping was done in the Copper and Bronze ages and during that era people used copper to knap with. Another is efficientcy, copper is quite soft and grips the flint extremely well as you apply pressure, whereas iron or steel can be extremely slippery. 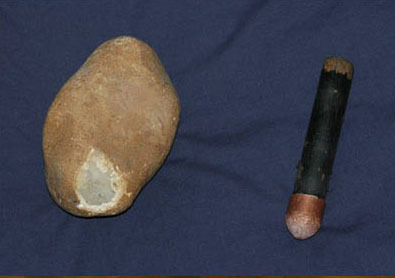 However in the UK while there is no evidence of iron being used during the iron age for presure flaking, it was used right up to the 19th century for percussion flaking in the gun flint industry. On the other hand in the US the American Indians adpted the use of iron nails once they discovered them from the settlers (as well as a preference for man made glass). Also recently people seem to be experimenting more and more with iron in knapping and you hear more about people using it, most knapping stores now seem to sell iron horse nails as well as copper ones, these I believe are a pretty soft kind of iron. Also there are a lot of people who are into fine notching, which is a very arty form of pressure flaking, and there are some modern 'fine notchers' (a kind of pressure flaker) out there for sale, that use iron or steel nails as copper is far too weak when that thin. Thanks for the info Grendel. My next mission is to hunt out some copper nails. i'll post pics of my kit and a bit more info when it isnt so late! You may have just coined the new phrase for knapping on the cheap, 'Womble Knapping'. I love it, w have to have a post entitled this. Here's a couple of vids best described as the Rolls Royce and the Bicycle. Somehow I prefer the bicycle. You know, I took one look at all those solid copper billets and my first thought was "I wonder what the scrap price of copper is just now"
My billets are made from bits of an old broom handle, shaped copper end caps, and lead I found while out metal detecting. The Ishi sticks consist of offcuts from salvaged wooden chimney sweep rods, copper nails, and some copper pipe offcuts. All together now "Underground, overground......."
If you're into womble knapping, you'll love this: for my leg pad I use two or three square carpet tiles as padding and a rubber backed doormat used rubber side up! This works beutifully and it beats anything else i've used, I think the carpet tiles where 25p each and I now need a new doormat! Bet you will look at your doormat in a new light after reading this! Great advice, I've used heavily folded Jeans in the past, 2 inches of Jeans makes a hell of a good custhon. the flakes slide off the rubber and into a tub to my left hand side, so I don't even have to sweep up much! It's not very archaeologically authentic but it works. Antler soft hammer. I know it a bit hit and his and you buy in weight but some pet shops do antler dog chews which are suplied by a local game dealer. sometimes you can get some real usefull ones. just have to ask and look before you buy. i got 2 about 30cm for £18.